Skateboards consist of three parts: the deck (the actual board), the truck (a component usually made of metal that holds the wheels to the deck), and the wheels. The average skateboard deck is about 32 in (81.3 cm) long, 8 in (20.3 cm) wide, and is a little less than 0.5 in (1.3 cm) thick. The deck has a defined nose and tail with a concave in the middle. Skateboard wheels are usually made of polyurethane and range in width from about 1.3-1.5 in (3.3-3.8 cm). While nearly all skateboards have similar shapes and characteristics, their dimensions vary slightly based on use. There are skateboards built for speed, slalom, and freestyle. Since skateboards first came into widespread use in the 1960s, their popularity has come in waves. Newfound interest is usually related to technical innovation, though a core constituency of skateboard enthusiasts has always remained. Though there is unconfirmed evidence that a skateboard-like apparatus existed as early as 1904, the more commonly accepted predecessor to the skateboard was created in the 1930s. In Southern California, a skate-scooter was made out of fruit crates with wheels attached to the bottom. This evolved into an early skateboard that was made out of 2x4 ft (61x121.9 cm) piece of wood and four metal wheels taken from a scooter or roller skates. This version of the skateboard featured rigid axles which cut down on the board's maneuverability. Recognizable skateboards were first manufactured in the late 1950s. These were still made of wood and a few were decorated with decals and artwork. Skateboards became especially popular among surfing enthusiasts, primarily in California. Surfers practiced on skateboards when the ocean was to rough, and they soon became known as "sidewalk surfers." One of the first competitions was held for skateboarders in 1965. While skateboards were popular through most of the 1960s, riders were not respected and the activity was banned in some cities. The first wave of skateboard popularity was over by 1967. Five years later, in 1973, there was a renewed interest in skateboards when wheels made of polyurethane were introduced. These early polyurethane wheels were composites of sand-like material that was formed into a wheel with an adhesive binder under extreme pressure. With the advent of polyurethane wheels, boards became easier to control and more stunts were possible. Also in the 1970s, skateparks were introduced. Skateparks were specially designed places that catered to skateboarders. They had obstacle courses, pools (empty bowls, usually below ground level like an empty pool), and pipes (large, circular type) to challenge skateboard riders. With skateparks also came more competition, recognition, and sponsorship. Skateboarders sometimes decorated the bottom of their boards with logos of their sponsors. By the end of the 1970s, skateboarding again became controversial after it became identified antisocial behavior. Due to the amount and severity of the injuries, skateparks closed in fear of lawsuits and the sport returned underground. When popular interest in skateboarding briefly re-emerged in the mid-1980s, it was not due to any particular technical innovation, though skateboard manufacturers were always experimenting with different materials in the production of decks. Instead, skateboarding videos featuring skateboarders performing extremely difficult and dangerous stunts using ramps, stairs, and even handrails generated new interest in the sport. At the same time skateboard art had also emerged. The bottom of skateboard decks were now elaborately decorated with logos and other designs. Continued resistance to skateboarders led to another down-turn in popularity at the end of the 1980s, though not as severe as previous years. By the middle of the 1990s, skateboarding again became popular mainly due to high-profile exposure like ESPN and MTV's X-Games competitions. These televised events of "extreme sports" showed the best of many kinds of skateboarding. Skateboarding was regarded as the first extreme sport. Though skateboarding was still banned or regulated in many communities, such exposure gave the sport an air of legitimacy. It is not as dangerous a sport as many think. In 1997 there were 8.2 million skateboards and around 48,186 reported injuries, 0.006% of which resulted in hospitalization. Compared to a more commonly accepted sport like basketball—which had 4.5 million participants in 1997 and 644,921 reported injuries (0.124% resulting in hospitalization)—the fear seems misplaced. Skateboard art also continued to evolve. Art was based on street trends and whatever was hot at the moment: comics, bands, logos, and original art. In the mid-1990s, deck manufacturers would introduce an average of six board designs per month, making only 1,000 of each. While skateboard manufacturers experimented with different thicknesses of veneers that made up decks, little changed in the actual manufacture of skateboards at the beginning of the twenty-first century. Most skateboard decks are made of glue and wood (usually maple), but some are made of composites, aluminum, nylon, Plexiglas, fiberglass, foam, and other artificial materials. They are usually decorated by screenprinting. Skateboard trucks are usually made of aluminum or other metal (steel, brass, or another alloy), though a few are made of nylon. Skateboard wheels are made of polyurethane (a synthetic rubber polymer). While some low-end skateboards are assembled by manufacturers, most components are sold separately to consumers who put them together on their own. To assemble a skateboard, the consumer also needs ball bearings (usually full precision and made of metal) and a piece of grip tape. Grip tape comes in a large piece bigger than the deck and looks like a piece of sandpaper. It is put on the top of the deck to provide traction. Skateboard decks, trucks, and wheels have different designs depending on how the skateboard will be used. Decks differ in their angle of concavity and the shape of the nose and tail. Manufacturers design their own boards with their own signature styling. They use templates to impose their design on the shape of the board. Companies that manufacture decks and wheels also make their products stand out by their individual art designs. While some of this artwork is created on computer, some is also done by hand. 1 A piece of maple wood undergoes a treatment that allows it to be peeled into veneers (thin sheets of wood) that are then delivered to the deck factory. They are stored in a climate-controlled environment to ensure the moisture content is optimized. Too much moisture is not good for the manufacturing process. 2 Each veneer is then put into a glue machine by hand. This machine evenly coats each veneer with a water-based glue specially designed for wood. 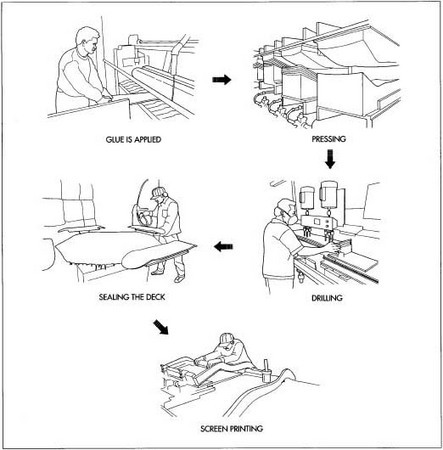 The manufacturing steps to make the skateboard deck. 3 After being coated, the veneers are numbered and stacked according to grain and level of use. Each skateboard is made of seven layers of veneer. The first, second, fourth, sixth, and seventh layers have the grain running from the nose to the tail of the board. The third and fifth have the grain running from side to side. These stacks are put into a two-part mold inside a hydraulic press. The mold creates the nose, concave, and tail of each skateboard. Each press makes five to 15 decks at one time. The resulting laminate sits in the press for anywhere from a few minutes to a few hours. The longer the time, the more naturally the wood and glue set. 4 After the laminates are removed from the press, eight holes for the truck mount are drilled by hand with a drilling rig. 5 A worker—called the shaper—takes the newly drilled board and, with a previously made template, hand-shapes each deck with a band saw. The deck is hand sanded and coated with a paint or sealant. 6 After the deck is dry, a decorative design is imposed by screenprinting. Each color is hand painted separately on a custom screenprinting machine. The decks are then dried and readied for shipment. 7 With one of three materials (wood, plastic, or clay) a master truck pattern is hand tooled. This is used to make a match plate. With the plate, a sand mold is made for making the actual truck. A sand mold uses sand as its primary mold material, usually with clay and water. The material is packed around the plate then removed. 8 Aluminum ingots are heated to 1,300°F (706.7°C) in a furnace, reducing them to a liquid. This liquid aluminum is poured by hand into the sand mold's pouring basin sprue hole and through runners into the gate (the actual opening of the mold's cavity). The sand mold has the truck's axles in place before the aluminum is poured in. The mold is allowed to cool, then broken by hand and the parts removed. 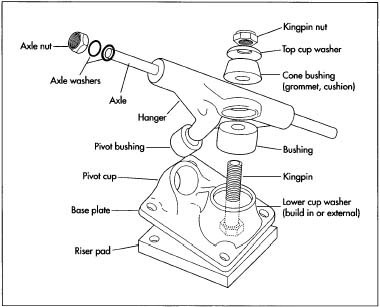 These pieces include the kingpin knob, pivot cup, baseplate, and riser pad. Using machines, a worker heat-treats each part. The parts are then grinded, polished, and drilled. 9 Finally, each truck is hand-assembled with kingpins, brushings, grommets, washers, and nuts and prepared for shipment. l0 In metering machines, two polyurethane components are heated and mixed together in a certain ratio. High-quality polyurethane wheels are mixed together at elevated temperatures (lesser quality wheels are mixed at room temperature). This step creates a liquid. If the wheels are to be colored, the pigment is now added and the resulting mixture is poured into aluminum molds via a mix chamber (if the urethane is high quality it is heated again) and allowed to harden into a solid. 11 The wheel is removed by hand and cured on trays. Many wheel molds are running at the same time on a conveyor system and 300 wheels can be made per hour. 12 The resulting wheel slug is cut to shape by hand on a lathe. With a blade, the sidewalls (also known as the radius) and tread (riding surface) are cut into the wheel. 13 If the wheel is to be decorated, this semi-automated process is next. Digital artwork is converted to film to make a photo-etched print plate. The image on the plate is printed on the wheel with a pad printing machine. The silicone pad is on an inked printing plate and transfers the images to the wheels. Wheel printing that incorporates more than one color goes through one pad for each color. The wheels are then packaged for shipment. 14 After purchasing/manufacturing the three separate components, the consumer or manufacturer must put them together. Grip tape is needed to provide traction on the board. Grip tape comes in a large rectangular sheet, bigger than the actual deck. It is smoothed over by hand to get rid of any air bubbles. Using a file or other flatedged object, the edge of the board under the grip tape is defined. With a safety knife or scissors, the extra parts of the grip tape are removed. 15 With an awl or an other sharp, pointed object, the eight truck holes are exposed through the grip tape, and the mounting bolts are placed. The truck is then installed over the bolts and tightened with the locknuts. 16 One set of bearings and a spacer are placed on each of the four truck axles. The wheel is put on next, flush with the bearings and spacer. The other set of bearings is put in the wheel. The wheels are secured with washers and a lugnut. The skateboard is now ready to be ridden. An example of a skateboard truck. tightly secured so that they will continue to hold the trucks in place while stunts are being preformed. Manufacturers continually check the finished boards to see that they are secure and meet safety requirements. In the production of wheels, any polyurethane left over is sent to a landfill. At the present time, it is too costly to recycle. Decks might be made of more artificial materials inside a wood exterior. One deck of the future has Nomex honeycomb at its core, with Kelver as one of the structural materials. Even with traditional wood decks the number of veneer layers may increase or decrease. The most noticeable difference might be the art on the bottom of the skateboard. Instead of being applied with a screenprinting process, decks might use a sublimation printing process. Wheels may change in their shape, color or decoration, but not much will improve on polyurethane itself. If a new material comes on the market, this may affect how wheels are manufactured.